Newt Gingrich wrote an Apple Watch review for Mashable. Newt Gingrich Wrote an Apple Watch Review. It Was Actually Pretty Refreshing. 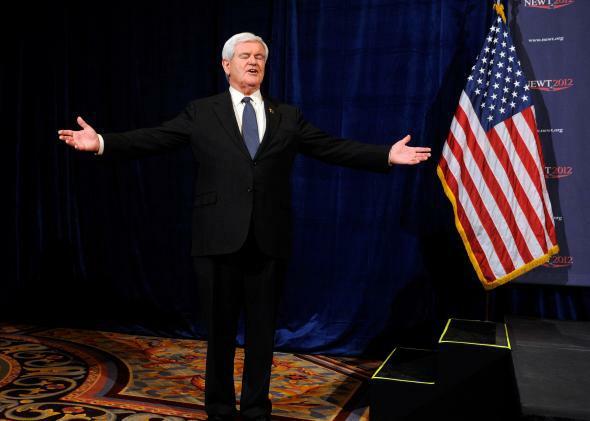 Newt Gingrich on Feb. 4, 2012, in Las Vegas. When the Verge ran its Apple Watch review in April, the site called it the “definitive” review. And it basically was. Other sites did extensive testing of the watch and contributed important insights, but the Verge piece was plenty. The only people it didn’t serve were those who don’t particularly give a crap about the Apple Watch. For that group, Newt Gingrich’s treatment on Mashable is the one to read. “It feels sort of watchlike I think,” Gingrich says in the beginning of the accompanying video review. And he’s totally right. For someone who has never seen, held, or tried on an Apple Watch, the first question is probably going to be: What’s it like to wear it? The review conditions weren’t perfect, because Gingrich didn’t like the aesthetics of the powder blue sport band he was given to try. “I know Mashable, you guys like blue, but you know for a guy my age this is a weird band. This is clearly a sign I’m either 12 or I’m a hobbyist.” But he still wore the watch for a day and tested it in a bunch of travel scenarios. What’s nice about the review is that it’s by a layman for the laymen. Gingrich talks about how nice it is to use the watch as his plane ticket, but how confusing it was to call the ticket up in the first place. He says he likes the calendar and the reminder taps. He can see the value of being able to call an Uber at the end of a meeting without taking out his phone.